"Gummy Bears are a tradition enjoyed by generations. Who better to turn to for inspiration or a new outlook on life?" 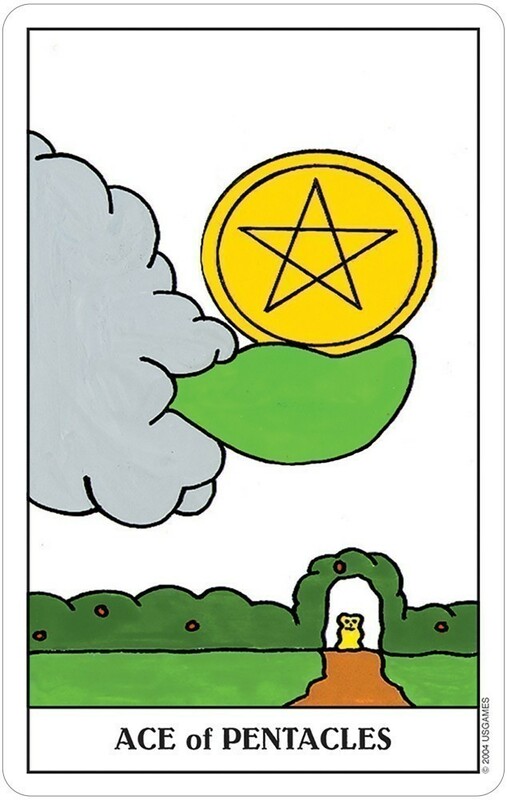 These adorable creatures have been transformed into unique renditions of the 78 Major and Minor Arcana based on the traditional Rider-Waite tarot images. The bears cast their magic spells, wield their wands, and delight in reaching out to people through their mischievous imagery in the cards. 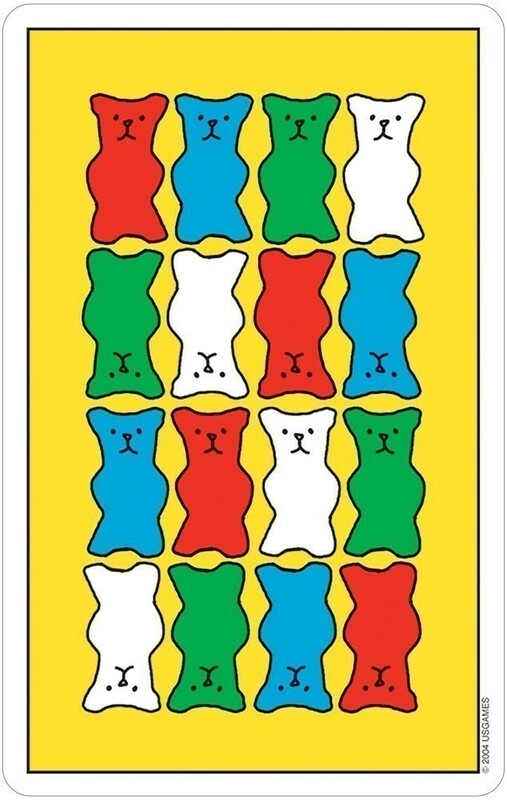 Gummy Bear Tarot comes packaged in a versatile tin and includes booklet of instructions. This is a pocket-sized deck. The artist Dietmar Bittich is of German descent but grew up in Canada. Bittrich found inspiration in the great outdoors where he jokingly says the last of the wild Gummy Bears might still exist. He coins himself "The Gummy Bear Oracle." 78 cards, 2.375" x 3.75" Tin, 2.625" x 4.125"
This is indeed my favorite deck and I will keep using it over and over again. It is cute and adorable and perfect for smaller hands. I wasn't sure if I would even resonate with such a deck, but decks can surprise you. If you want younger people to get into card reading, this is a perfect deck. It is set up in the Rider Waite style, which I love. I learned on the original Rider Waite deck growing up. This deck totally doesn't have an evil vibe in the entire deck. I smile every time I see it. I want to thank U.S. Games for having the courage to put out a deck like this. I really do LOVE it! A definite must buy! Get it now! "Gummy Bears are a tradition enjoyed by generations. Who better to turn to for inspiration or a new outlook on life?" 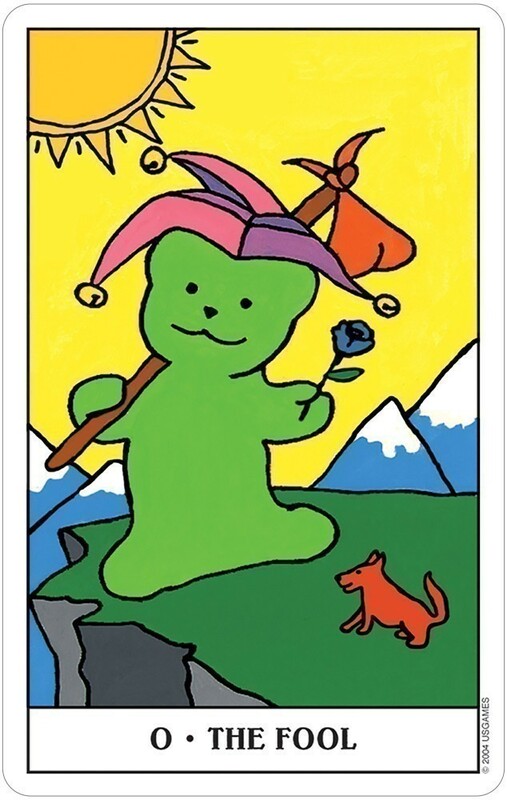 This quote from the 59-page companion booklet from the Gummy Bear Tarot from U.S. Games by Dietmar Bittrich says it all, do not dismiss this deck as juvenile, as I did for a long time before examining it closer! The art style most certainly is simplistic, although it does closely follow Rider-Waite in a very pared-down way. However, this serves to make it very easy for the intuitive Tarot reader from beginner to advanced to just blossom with psychic inspiration. I feel the clarity of the cards, the 'crayola'-like colors, and the happy images help the alpha waves flow. The fronts of the cards have a minimal white border, and the Major Arcana are labeled with the Title and also with the number (Fool=0). Some of my favorite Major cards are the Devil and Death, and the Hierophant (who appears female to me). The Minors are labeled also, and two of my favorites are the 5 of Pentacles, with two forsaken Gummies outside the church (one lame), and the ominous black-caped Gummy of the 5 of Cups. The backs of the cards have 16 bears, 4 rows of 4, red, blue, green, and white. It is impossible to tell from the back if you have drawn a reversed card. When reading with this deck, I found it very easy and a pleasure to use. It is definitely querent friendly. The booklet recommends using the Celtic Spread, or one- to three-card readings. As far as meanings of the cards, the meanings in the booklet assigned to the cards are slightly different and much more positive than Rider Waite, and there are no "reversal" meanings per se, only "strengths" and "weaknesses. One thing I loved about the booklet is that for every card, despite strength or weakness, it has an assigned "Task" per card, such as for 5 of Cups the Task is "Renewal". This is a very easy concept for anyone, your querent, or yourself if meditating with the deck to grasp. A definite plus is that it comes in a cute little tin for card safekeeping. I would highly recommend this deck to both new and advanced readers. New readers can easily learn from the numbering of the cards, and the simplicity of the meanings in the booklets, especially the "tasks"; and advanced readers, especially Gummy lovers or Rider-Waite or Hansen-Roberts readers will be refreshed by the art and get many laughs. That alone is worth the price of the deck! This is my new favorite deck, and I own about a dozen. I look forward to my daily reading and find these cards are easy to connect with and very accurate and easy to read. They are elemental and whimsical at the same time. A very wonderful deck for beginners, old timers and a great teaching tool for kids. They are a sweet and tasty treat I enjoy every day. Try some ..a healthy and enlightening snack. 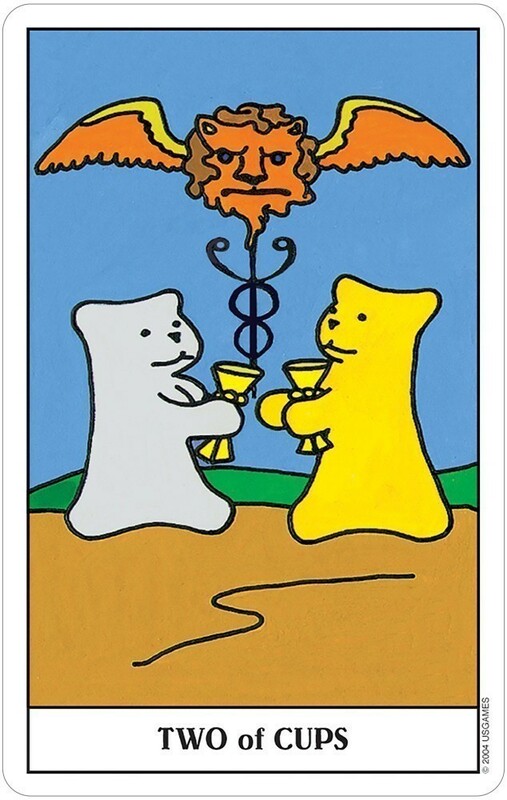 Ah, ya gotta love the Gummy Bear Tarot. 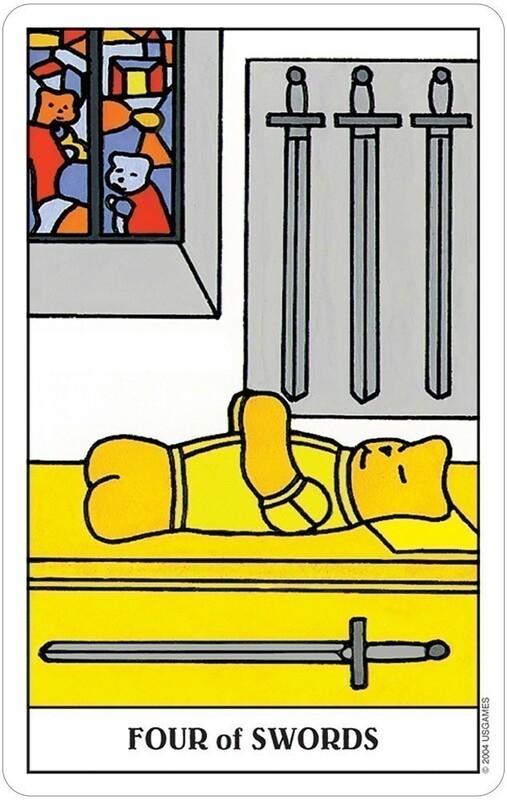 I don't like eating gummy bears, but as tarot characters, they are simply irresistible! First of all, it's one of the decks US Games has packaged in a tin, which is such a brilliant idea. And like the other tarot-in-a-tin decks (Vanessa and Halloween), the deck is pocket sized and printed on matte card stock. So right out of the gate, it's got three things going for it. And we haven't even gotten to the reading of the cards yet. 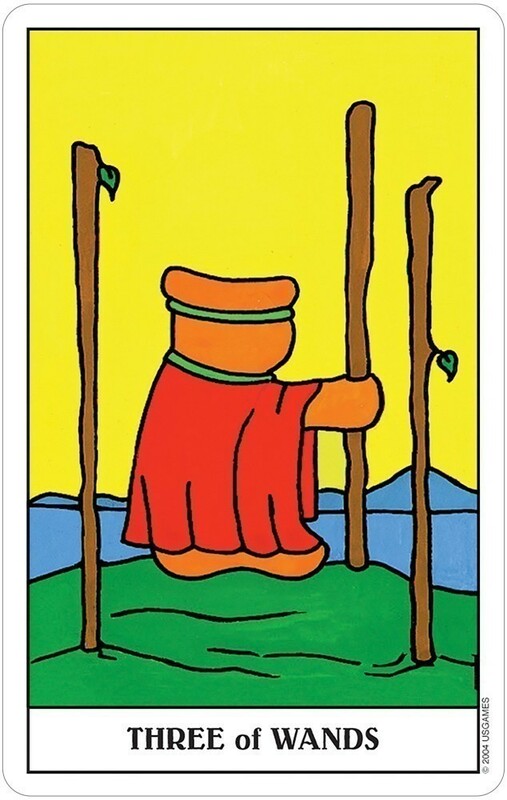 The Gummy Bear Tarot follows the traditional RWS imagery so it is ready to read right out of the box. The vibrant colors and G-rated illustrations make it ideal for children or those less comfortable with the "scarier" images in traditional tarot. It's also a great deck for when you want truthful readings, but you want them presented in a more light-hearted manner. For example, I had a particularly difficult week, and I wanted to use a deck that would lift my spirits, while not necessarily sugar coating the readings. This was the perfect choice, and it did just that. You would think that with such a silly premise, this feel-good deck wouldn't be able to provide serious readings. You would be mistaken. This deck speaks in a very easy manner, and is very straightforward in its messages. I can see it easily being used for everyday reading. The LWB is great too. It is deck-specific and provides interesting insights into the cards. What I love about it is that they don't give the usual upright and reversed meanings. Instead, they provide "strengths" and "weaknesses" for each card, so if you don't read reversals you can still get a full, balanced sense of each card. Also, each strength and weakness is accompanied by a wise (and often humorous) saying and a task. 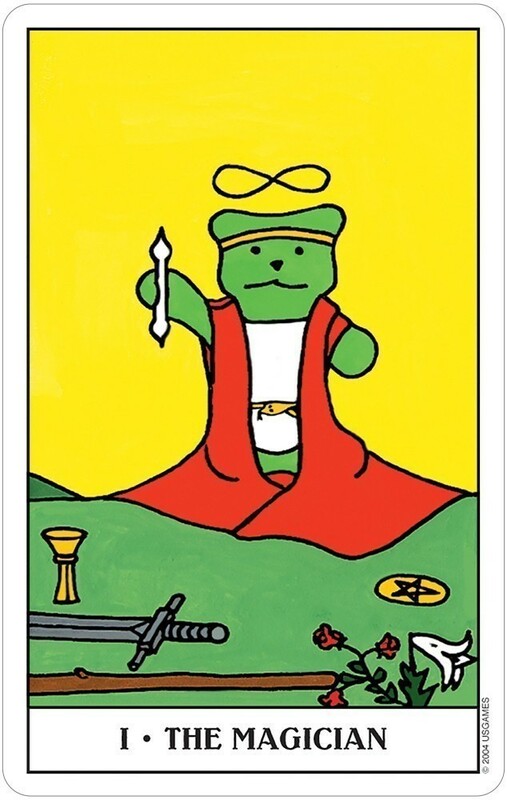 I think the Gummy Bear Tarot is a great all-purpose deck. It has surprised me by sneaking into my list of favorite reading decks. It's kid-friendly, it's adult-friendly, what more could you want?